Frederick Douglass Bicentennial: Finding Douglass In Rochester, N.Y.
History surrounds us in Rochester, N.Y. But our community&apos;s legacy in African American history is especially noteworthy. Rochester&apos;s most widely recognized contribution to African American history, stems from one of our most notable residents, Frederick Douglass -- abolitionist, orator and publisher. 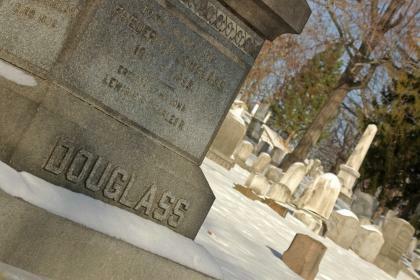 Douglass called Rochester home from 1847 to 1872, and lived here longer than anywhere else in his life. In Rochester he published his newspapers, the North Star and Frederick Douglass’ Paper, assisted friends Amy and Isaac Post in Underground Railroad activities, hosted runaway slaves in his own home, gave speeches, supported women’s suffrage alongside suffragist Susan B. Anthony and much more before moving to Washington D.C. in 1872. Frederick Douglass&apos; legacy continues to be felt in Rochester to this day. He was laid to rest in Rochester&apos;s historic Mount Hope Cemetery, which also happens to be the final resting place of suffragist Susan B. Anthony. Not too far from Mount Hope Cemetery is the Frederick Douglass Monument, honoring Douglass in Highland Park.The monument, which is eternally facing north, is located steps from the former site of Douglass&apos; home and is believed to be the first public statue erected to memorialize an African American in the U.S.
Douglass is also memorialized alongside his friend and fellow civil rights champion (and Rochesterian) Susan B. Anthony in a bronzed sculpture depicting the two sitting down for tea in Susan B. Anthony Square. 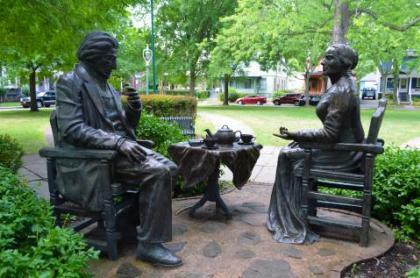 The sculpture is titled "Let&apos;s Have Tea." The famous suffragist and abolitionist were close friends who shared the common goals of social justice and civil rights. Now they share a proud place in Rochester&apos;s history. 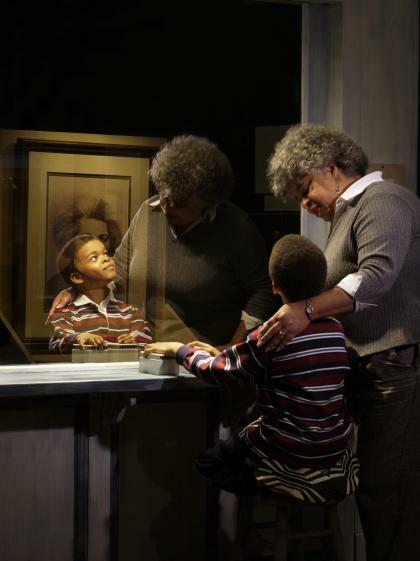 The Rochester Museum & Science Center today features exhibits exploring the life and legacy of Frederick Douglass, as well as Rochester&apos;s Underground Railroad Stops, in an exhibit titled "Flight to Freedom." 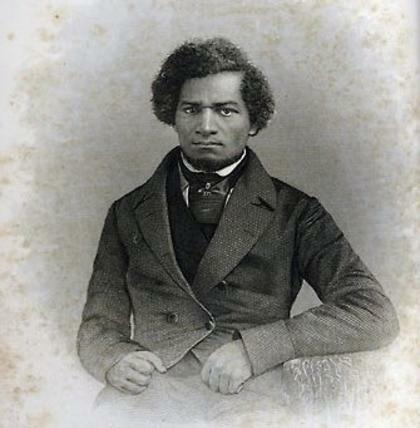 Want to learn more about Frederick Douglass and Rochester&apos;s ties to the Underground Railroad? Consider an Akwaaba Heritage tour, which bring these sites and stories from Rochester&apos;s history to life. 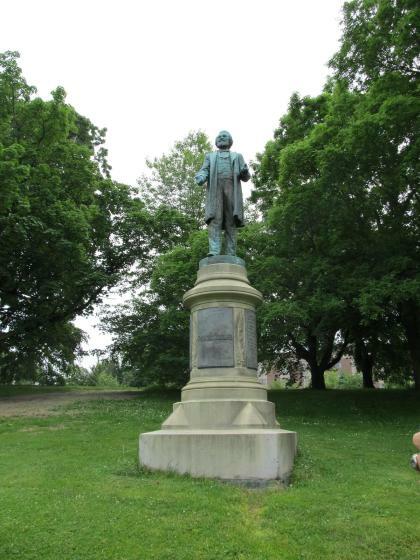 The spirit and legacy of Frederick Douglass can be discovered throughout Rochester. As a community, we&apos;re very proud of this Rochester son, and we work to preserve his memory and honor his legacy every day. 2018 marks the bicentennial anniversary of the birth of Frederick Douglass. To honor Rochester’s legendary social reformer, Mayor Lovely Warren and County Executive Cheryl Dinolfo have officially proclaimed 2018 as the “Year of Frederick Douglass.” To learn how you can celebrate the life and legacy of Frederick Douglass, visit: www.cityofrochester.gov/frederickdouglass200/.